Blandine Umuziranenge is the founder and Managing Director of KOSMOTIVE, a social enterprise that focuses on improving maternal and child health in Rwanda. She was born and raised in the northern province of Rwanda. Early in her career she worked as an intern at Contact FM radio station. Following her degree program, she worked at Rwanda Broadcasting Agency. She holds a bachelor’s in Business Information and Communication Technology from Mount Kenya University and an Advanced Diploma in Information Technology from Tumba College of Technology. She has achieved various professional certificates in IT, Entrepreneurship, Photojournalism and Film-making, and is a Script Writer and Fashion Designer. With her background in communication and technology, Blandine decided to start a company that self-publishes print and online periodicals and has developed a Healthcare App for pregnant women that sends alert messages related to their pregnancy term and has a call button feature for individuals seeking urgent care and home-based healthcare services. Blandine founded Kosmotive in January 2014; since then she participated in Africa Entrepreneur Collective incubator for one year, after which she has been awarded the Akili Dada Fellowship and attended its social entrepreneurship and leadership yearlong program. At the end of 2015, she has been awarded for These Numbers Have Faces Accelerate Academy Fellowship through which she attended the world class entrepreneurship training program at Regent University. From January to July 2016 she attended the Peace Through Business Leadership Development program from Northwood University and became a 2017 Tony Elumelu Entrepreneur. 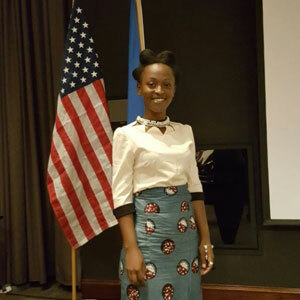 Blandine Umuziranenge lives in Kigali, Rwanda.